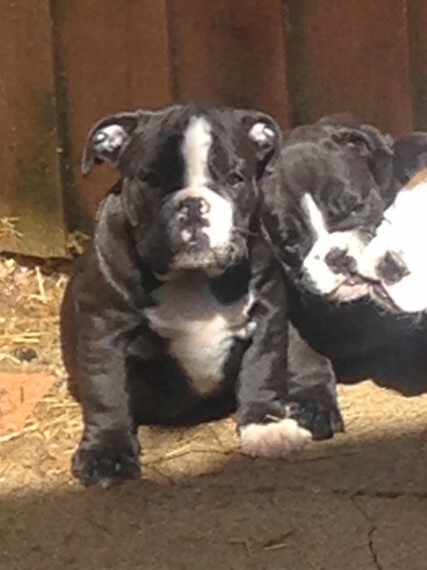 Here for sale is a litter of quality stocky old English bulldog puppies. These puppies have been bred to maintain all the looks of the bulldog but none of the health issues. Mother is old English bulldog father is English bulldog. Both parents are huu clear. Both parents have great eyes and breathing. Males and females available. Puppies have been vet checked. flea treated and wormed every 2 weeks from 2 weeks of age. They..ve been fed a quality diet and are socialised with other dogs. They..ve been bought up with children and they are used to going in a dog crate. Mother and father both have excellent temperaments are family pets and are here to see. Puppies are ready to leave 16th May and will have had their first inoculation and be microchipped. They will come with their pedigree. NEBBR registration certificate. a bag of their food and a puppy blanket with mum and the other pups scent on to help them settle into their new homes. Lifetime of advice.support offered with these puppies. The fifth and sixth pics are of the mother and the last two pics are of the father. Pups are 1150 each.